I just tested from my cell phone and so far it works great. I tried to post a new topic and reply to an existing topic. Well as long as it works from one single mobile device, everything is alright? That's what I have to do to fight spam. Unless you want this forum to turn into spam central. I don't see anyone getting any help with anything around here besides viagra and whatever other nonsense people are peddling these days. I don't care much about anon posters if one doesn't care to register they don't care much to contribute either beyond the initial question. @Lanik Just FYI, http://i.imgur.com/hYdJ7Gq.png ...after solving the recaptcha. Okay please try that again and see what happens. That's not an extension any longer that's what's built into PHPBB now. I cleared out the cache in the forum and CloudFlare so I'm at a loss right now. Can you please elaborate? I'm not seeing anything when I page through topics right now. Yesterday there was no pagination and all messages have been displayed on the same page but fixed right now. PS: http://i.imgur.com/8bllyA8.png i think the default should be 50 topics per page & 15 posts per page. I custom set mine to 50 posts per page. 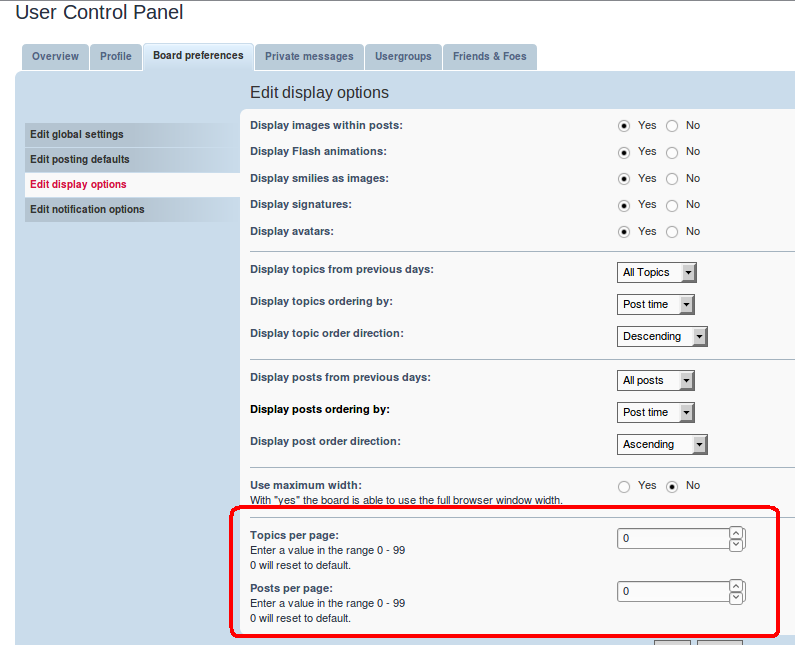 The board setting isn't enforced though so I'll set it to 30 topics per page and 50 posts per page. There's a field for a captcha, however no captcha is shown when posting without loggin in.